…It may sound like a less enticing version of the compound in Westworld, HBO's sci-fi Western, but it's not an unbelievable reality. In fact, technology is already transforming work and the workplace. To the extent that we are all products of our environment, the digital age has generated reverberating effects on the culture of work. The information revolution has changed the foundation of industry from vertically integrated mass production to expansive networks of specialisation and service-oriented business models. In the early 20th century, the workplace centered around assembly lines, engendering a factory mentality. Then came computers, which marked the onset of knowledge work. Today, we live in a knowledge-driven world in which the levels of connectivity and communication enabled by the internet and the smartphone breed both a new kind of organisation and employee. According to the Pew Research Center, millennials (adults ages 18 to 34 years old in 2015) edged out Generation X (35 to 50 years old) as the largest share of the labor force (at 34 percent) in the first quarter of 2015. Such a shift brings different career expectations. Whereas their predecessors may have displayed more of a happy-tobe-here, we-before-me attitude within the companies they worked for, millennials want more from their employers. Growing up within an on-demand, world-at-theirfingertips universe, these digital natives prize work arrangements that offer flexibility and choice, such as the option to work remotely. They don’t see their jobs as just paychecks but desire to engage in meaningful work, and they don’t want their employers’ goals to conflict with their personal values. According to a 2012 report from Net Impact, an international nonprofit for people interested in using business skills for social good, more than 50 percent of millennials who participated in the study said they would take a pay cut to find work that matches their values. Furthermore, a 2014 report from the Millennial Impact Project found that more than 90 percent of respondents wanted to use their skills for good. Further exacerbating this change in culture: the end of employer loyalty. Employees can no longer expect to be lifers at a single company but will instead bounce around. Many prefer to work on a project-to-project basis. A fall 2016 study from Upwork, in partnership with the Freelancers Union, found that the freelance workforce grew from 53 million in 2014 to 55 million in 2016, currently representing 35 percent of the U.S. workforce. Add to that the growing number of people opting into the sharing and gig economies by choice—up 10 points, to 63 percent, since 2014—and nontraditional employment can become a viable way to make a living. Technology, according to 73 percent of respondents, has made it easier for freelancers to find new projects and clients. More and more, expect traditional companies to accommodate this trend, says Jory MacKay, a blog editor for Crew, a staffing startup based in Montreal. "Instead of rising to the top by cutting costs and tweaking your production flow," he writes, "companies are approaching tasks with a more modular view, bringing in the pieces they need when they need them." To do just that, Crew helps companies by connecting them with experienced, independent creative professionals to complete any project. Other factors are facilitating the growth of the freelance economy. The rise of coworking spaces, such as WeWork, remove the need to be chained to a desk somewhere near a manager, who may historically view physical presence as a sign of productivity. And online platforms and marketplaces, such as Uber and Airbnb, allow individuals to cut out the middle man; as independent contractors, they don’t have to deal with any of the strictures that may come with working for a traditional corporation. Both speak to the DIY philosophy that is seeping into our modern understanding of what employment is. It’s no surprise that today, the most desirable companies to work for are in the tech field. These organisations not only create new technologies but internalise them into everything they do while ultimately prioritising their employees. The digitisation of everything has enabled these companies to upend traditional businesses. The Googles and Facebooks of the world have shown us that it’s no longer enough for companies simply to embed technology into their products; they need to integrate it into the core of their businesses. From streamlining organisational knowledge to augmenting HR, communication, and tracking employee engagement, the tools are already in place. Just as smart buildings use sensors to track a variety of metrics, employees are similarly being monitored. With a practice known as "people analytics," companies can get a holistic, real-time understanding of their workforce. Digital natives who want freedom of choice have a different relationship with privacy. They are more accustomed and willing to trade their personal information in exchange for greater convenience and seamless intervention from technology. Think of Google alerting someone when it’s time to head to an appointment off-site because it knows where the user is and how long it will take him to get where he’s going. This gives employers the ability to accurately track employee progress and be attuned to changing dynamics in real time. Pair those sensors with enterprise social networking software like Slack’s, and employees also become connected to the ins and outs of the organisation. The platform is becoming a control panel for office workers, keeping them in constant communication, exchanging organisational knowledge, and even interacting via conversational interfaces. AI-enabled apps help customise the platform to streamline day-to-day operations; employees can seamlessly submit expenses, request information about marketing metrics, or schedule meetings and book conference rooms. New hires can be streamlined into the organisation in a similar fashion with notifications about the latest employment and policy updates. The system can also field questions that persistently bombard HR staff: When do we get paid? Do wehave Friday off? How do I change my dental insurance? Meanwhile, HR is leveraging new technology to create smarter teams. Google has adopted project management tool Teamily to determine staff compatibility by distributing employee surveys and analysing responses, while more than 600 companies, including Goldman Sachs, use videointerviewing software from HireVue to analyse facial expressions while vetting potential candidates for hire. Beyond hiring and efficient workplace collaboration tools, however, there is of course the specter of AI and machine learning’s relieving employees of their work responsibilities altogether in certain industries. Like it or not, humans and robots are already working side by side in Amazon’s fulfillment centers. Employees there spend about a minute retrieving an item from a shelf, then boxing and shipping it, according to CNN Tech. Robots and automated systems complete the rest of the order from there. For now, the nature of work available to humans will continue to change: Machines will perform mundane, repetitive tasks and sift through impossible amounts of data, while humans will be freed up for more creative, strategic thinking and complex duties. Machines will become increasingly capable, but a human touch will always be of value. People who are concerned about being replaced by machines need to be aware of any subtle but necessary shift in skills to maintain relevance in the job market. Employers are increasingly offering upskilling opportunities to do just that. With the proliferation of technology, there has already been an increase in "new collar" jobs in fields marked by a dearth of qualified individuals. Think software engineering, cybersecurity, data science, and artificial intelligence. A sizable skills gap between the U.S. education system and the evolving workforce is prompting tech companies such as IBM to hire more people from coding "boot camps" rather than college-degree holders. These companies are also taking training into their own hands. Amazon, for instance, has announced that it is partnering with the U.S. Department of Labor to train veterans for tech-focused careers. The shift of focus to the individual is why, in many ways, the workplace is being redesigned around the employee, with engagement and experience ingrained in both physical and digital touch points within a company. The shifting culture of work and the digital revolution demand that companies become as mobile and agile as the people they hope to employ. More and more, organisations are recognising that to effectively engage their employees, technology needs to be considered at every level of an organisation’s design—from the physical office space to project management to recruitment to onboarding, training, and every point along the employee journey—all in the name of designing the best possible employee experience. 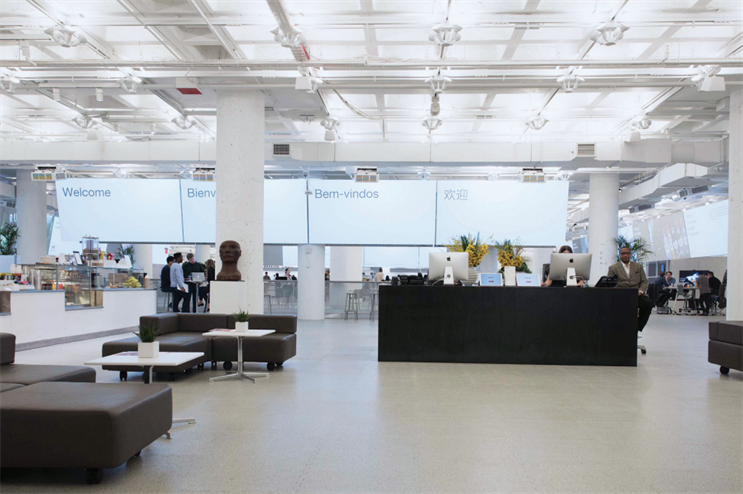 R/GA is blending its digital and physical environments as "Connected Space" offices around the globe, and has begun helping clients implement similar innovative technologies and designs into their workplaces. "Being connected to more information and more people makes your job easier," says Nick Law, Vice Chairman, Global Chief Creative Officer, R/GA. These spaces are designed to be flexible yet tailored, communal yet individualised, tech-heavy yet humancentric, enabling rapid innovation, engagement, and collaboration. "We’re creating dynamic environments where there’s a bit of tension," says Law, to foster diverse thinking on cross-disciplinary teams. The Edge, Deloitte’s smart building in the Netherlands, is connected via a network of sensors, and its smartphone app guides employees through their day. Everything is connected and tracked so that the app and all of its services can operate efficiently and evolve continually. Other companies are also reimagining their physical spaces—though on a much smaller scale—to give employees the mobility, flexibility, and choice they desire while maximizing their productivity. By creating the right balance between quiet, focus-driven spaces and collaborative areas that foster interaction, organisations aim to increase the levels of motivation and productivity in their workers. Casual spaces, such as coffee bars and cafés or lounges, are of equal value since they are conducive to both work and serendipitous encounters that often lead to unexpected collaboration and inspiration. From an operational standpoint, technology is being implemented to capitalise on employee behaviors. Much the same way that brands tap into consumer behavior to design habit-forming products and services, so too are organisations identifying employee behavior that can be channeled to drive collaboration, creativity, and innovation. Microsoft’s recently launched chat-based workspace tool, Teams, for example, enables real-time communication and aggregates notes, schedules, and files into one place. The app platform is key given the attachment we all have toward our smartphones and our affinity for constant contact. As we continue to practice always-on behavior, the balance of work and life is getting turned on its head. People can now work from everywhere, and introducing more of these customisable communication tools will only further enable this advancement without sacrificing productivity. Organisations that can continue to find new and creative ways to work, both digitally and physically, are going to set the pace when it comes to establishing an environment where employees can and want to do their best. This will be a top priority for as long as it takes robots to replace us for certain tasks and in certain roles. As Daniel H. Pink, one of the world’s leading business thinkers, observes, "Talented people need organisations less than organisations need talented people."